Wabash College’s Visiting Artists Series will present Takács String Quartet at 8 p.m., Wednesday, February 18, in Salter Hall in the Fine Arts Center. Recognized as one of the world's premiere string quartets, the Tak·cs Quartet is known for gripping, musical interpretations, and innovative programming. 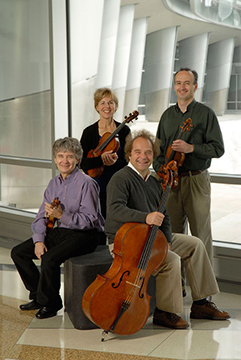 Based in Boulder at the University of Colorado, the Tak·cs Quartet performs 90 concerts a year worldwide, performing throughout Europe as well as in Australia, New Zealand, Japan, and Korea. The quartet members are associate artists at the South Bank Centre in London, performing several concerts there each year. The quartet’s multi-award winning recordings include the Late Quartets by Beethoven, which in 2005 won Disc of the Year and Chamber Award from BBC Music Magazine, a Gramophone Award, and a Japanese Record Academy Award. Their recordings of the early and middle Beethoven quartets was awarded a Grammy, another Gramophone Award, a Chamber Music of America Award, and two awards from the Japanese Recording Academy. "The Tak·cs have the ability to make you believe that there’s no other possible way the music should go, and the strength to overturn preconceptions that comes only with the greatest performers," said Gramophone magazine. The group will be performing, Haydn’s String Quartet Op. 77 No. 1, Bartok’s String Quartet No. 5, and Schumann’s String Quartet Op. 41 No. 3.